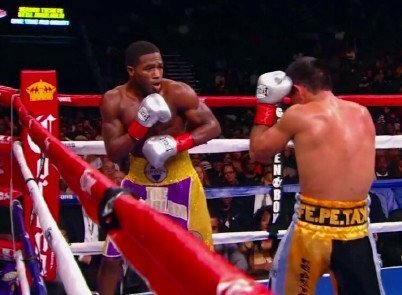 By Paul Strauss: Adrien “Problem” Broner is a star in the making. You doubt that? If so, it’s obvious you haven’t done your homework. Look around, read a little and listen to boxing people in the know. You will soon realize the media want this guy to be boxing’s next star. One prime example is Ring magazine’s current edition. It devotes considerable ink to the undefeated youngster from Cincinnati, Ohio. However, when preferential treatment is allotted, it begs certain questions. For example, “Is all of this attention justified? Does “Problem” deserve all the attention”? The media is in the star making business. Star making “sells newspapers” as the old saying goes. That’s obvious, so don’t necessarily look to them for answers. The media will too often shrug and say what they do is acceptable behavior in modern society. Many in the entertainment business from Mae West to Floyd Mayweather, Jr. have understood that fact and exploited it to the hilt. The truth is there’s always been a kind of unholy union between a star in the making and the media, kind of a wink wink thing. It’s not a new phenomenon, and in fact unholy unions even exist on a much more serious level with governments. In the olden days, a man from the royal family of one country would agree to marry a woman from the royal family of another country just so the two could sacrifice their unholy union for the benefit of the two powers. There was some nobility in that. In boxing, it’s simpler and there’s almost always no nobility involved. It’s more of what some might call an eye condition. The “star in the making” and the media are blinded, because of the squint they have on the almighty dollar sign. With Adrien “Problem” Broner, he planted the seed with some childish theatrics, and the boxing media took the bait. They believe the seed has germinated, and they are intent fertilizing it. Will their union be beneficial to boxing? It depends on your point of view. Monetarily, the answer is almost certainly “yes”. For Broner, there is the possibility of bigger fights, spectacles and huge paydays. Unlike the more perfect union, for the boxing purist there is no innocence created out of this one, and as often is the case, something undesirable is created. In a selfish society, the innocent are aborted. But, in the world of boxing, the truth is there’s no chance of that happening. When the result or “act of making” has been completed and fits the societal mold, then it no longer matters what is best for boxing, but what’s in style. It’s the way of things. The result, in general, and the viewing of it is met with enthusiasm and the star becomes a “hot ticket”. The unholy union has succeeded. The objective has been reached. But, will this star in the making truly be a success, or will he be like many others who have quickly come and gone? Will the truth come out when the light of day shines on him? Will he be exposed as just another self-luminous gaseous celestial body, soon to be waning in fortune and fame? That could very well be the case. There are those foretelling of a bright object coming out of Tijuana, Mexico. This light is preparing to make that fortune a reality. This light, named Antonio DeMarco, is glowing with confidence, “……wide eyed and grinning….chanting, ‘I am the (star) destroyer’…..!” You want answers? Then come November 17th, check out the sky over Boardwalk Hall, New Jersey, and see which light shines brightest.